While Cyrus has successfully twerked her way into the public eye with her recent MTV Video Music Awards performance, Lopez is busy performing a different kind of service. “There’s a lot of people out there that don’t have what we have, so you always want to give back and see how much you can help,” Lopez said while sitting in the Matador Involvement Center, where she currently works as an event assistant with Unified We Serve, CSUN’s volunteer program. While she was only an extra on “Hannah Montana,” Lopez believes the experience influenced her development from a pre-teen into the adult she is today. “At first, it was really hard for me to even speak in front of a crowd or be able to go up to a stranger and say hello, so that really helped me, especially at a younger age, (to) come out of my shell,” Lopez said about her 15 minutes of fame. Serving her community has been a part of Lopez’s life since starting her own club in high school, Helping Our Teens. The club raised enough money to send seven couples to prom and transformed an entire classroom into a place where financially-strained students could obtain donated prom dresses. Lopez said she loves seeing the smiles on people’s faces when they thank her for her generosity. “(I like) just knowing that they don’t expect to be helped, but we’re there to help, and the joy of knowing that we’re able to help someone put a smile on their face, make their day a little brighter,” she said. During her time at CSUN, Lopez has majored in graphic design, sociology and psychology. She recently changed her major to journalism with an emphasis in public relations. In addition to Unified We Serve, Lopez is also a member of Colleges Against Cancer, and the cultural sorority Alpha Pi Sigma. White feels Lopez’s role at the Involvement Center is indicative of who she is as a person. White and his coworkers like to have a little fun with Lopez’s stint in the entertainment industry. Justin Weiss, activities coordinator for volunteer programs at the Matador Involvement Center, has worked with Lopez since July and says she has already made a big impact on him. “She has the ability to connect so well that I know that regardless of what kind of field she goes into, she’s going to be very successful at it,” Weiss said. White hopes that his bond with Lopez will last long after they have graduated CSUN. Dozens gathered to celebrate the spirit of Jusdeep Singh Sethi at a memorial service held in Matador Square yesterday to commemorate his 21st birthday. Sethi, a CSUN student who drowned on Aug. 11 during a family trip to Big Bear Lake, was well-known for impacting many lives and always spreading positivity. The celebration brought together some of Jusdeep’s passions such as art, nature and hip-hop music. Attendees potted small plants in origami pots made from newspaper pages and created cardboard paintings with spraypaint. Jusdeep Sethi was involved in many organizations focused on humanitarian and environmental causes. A recent project Jusdeep Sethi helped organize was “Bridging the Gaps: Hip-Hop in the Age of Mass Incarceration and Deportation” conference, which has been postponed due to the death. Pan African Studies professor Anthony Ratcliff, whose relationship with Jusdeep Sethi started in 2010, said Jusdeep Sethi had friends of various races and backgrounds. During the memorial, Jusdeep Sethi’s parents were presented with a certificate of recognition in their son’s honor by William Watkins, vice president of student affairs. Watkins said the certificate was signed by CSUN President Dianne Harrison. “I’m humbled. I’m moved. I’m touched,” Mohinder Sethi said, holding the certificate with tears in her eyes. Marvin Jordan, 24, an Asian American studies major, was a member of the poetry slam team with Jusdeep Sethi and performed a poem in his honor. Preet Singh’s decade-long friendship with the deceased continued while he attended CSUN as an information systems major. Jusdeep Sethi’s brother, Mandeep Sethi, performed at the celebration and said the spirit and soul of his brother has given the Sethi family strength. “It’s been a deeply spiritual process for us to be able to channel his spirit and his soul and channel the strength that it had and that it has to give us strength,” he said. Mandeep also said that despite Jusdeep being gone, his spirit will never be forgotten. Preet Singh’s brother, Manmeet Singh, remembers Jusdeep Sethi as a person who had a gift for interacting with others. “He would put 200 percent of effort into trying to just get to know every single person out there, trying to understand them and trying to help them if they needed help, or get help from them to help other people he already knew,” Manmeet Singh said. Mohinder Sethi expressed deep thanks to CSUN for organizing the memorial event for her son. Nearly 1,000 students visited Bayramian Lawn for Meet the Clubs on Tuesday between 11 a.m. and 2 p.m. The lawn was filled with more than 200 clubs. Each organization was stationed at a table where they distributed flyers, pamphlets, photos and more promoting their activities. Adrian Porto, senior business management major, was on Bayramian Lawn promoting his fraternity. Porto said he would have “never joined” his fraternity if an event like Meet the Clubs did not exist. A range of organizations participated in the event: religious-oriented clubs, academic clubs, fraternities, sororities, recreational clubs, athletic clubs, community involvement clubs and more. Catherine Hartnek, senior electrical engineering major, is interested in potentially joining a sorority and a club associated with her major. She appreciated the face-to-face interactions that the event provided. Some clubs had display boards that contained information about their organization while handing out other material for curious students. 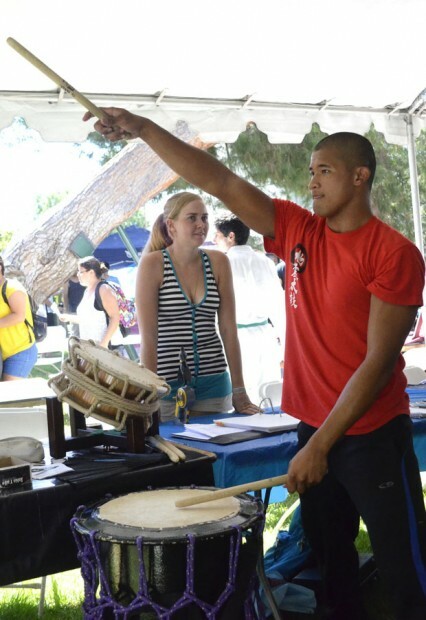 Canopies with representatives from Associated Students and the Matador Involvement Center were also present. Freshman biology major Diego Zuniga feels that joining a club or organization makes the college experience more worthwhile for students. Agustin Garibay, activities coordinator for clubs and organizations at the MIC, said this semester’s club-showcasing event is the largest they ever had. Wednesday Sept. 4 is the last day of the Meet the Clubs event. It will be held from 11 a.m. to 2 p.m. on Bayramian Lawn. A car crash ended with the arrest of two possibly armed suspects near CSUN Thursday. The pursuit started at Roscoe and Reseda at 2:55 p.m. and ended around 3:40 p.m. at Darby Avenue and Nordhoff Street. Toward the end of the pursuit a police squad car performed the Pursuit Intervention Technique (PIT) maneuver, sending the suspect’s car smashing into a tree in front of the Northridge L.A. Public Library. The two suspects had allegedly committed a robbery a few weeks ago according to Los Angeles Police Department (LAPD). The male driver and female passenger were apprehended and taken into custody. “A firearm wasn’t recovered but the suspect was armed in the original robbery that occurred a few weeks ago,” LAPD Capt. John Egan said. LAPD will wait until things stabilize before doing another thorough search for the weapon, Egan said. Egan also said that the LAPD might contact the fire department because the weapon may have been tossed on a roof. While pursuing the suspects LAPD contacted CSUN PD and asked for assistance in the pursuit. “We did help them,” said Anne Glavin, CSUN chief of police. Glavin said that the LAPD helicopter called CSUN PD to “mutually aid” them in the pursuit. Four helicopters, two from LAPD, searched the surrounding areas after the crash for the suspects. Katheryn Lopez, 21, senior sociology and criminology major, was leaving her class in Nordhoff Hall when she saw the helicopters. The male suspect received medical treatment for minor injuries sustained when he resisted arrest and was being taken into custody. The female suspect was arrested and placed on a gurney because she complained of an injury, according to LAPD media relations. Alma Banuelos, an employee from VIP Outpatient Treatment Center, across the street from the L.A. Public Library, said that the police officers were not supposed to chase down a suspect in front of a public library or next to a school. LAPD said more information will be available once the investigation is complete. Champaign Williams, Lucas Esposito, Trevor Stamp, Megan Diskin, John Saringo-Rodriguez, Andrew Martinez contributed to this story.